There are a number of overseas mobile Wi-Fi router services rental services in Singapore so it is important to know what to look out for so that you get the most value for money deal. I look out for two things – coverage and cost, when renting these overseas Wi-Fi services. 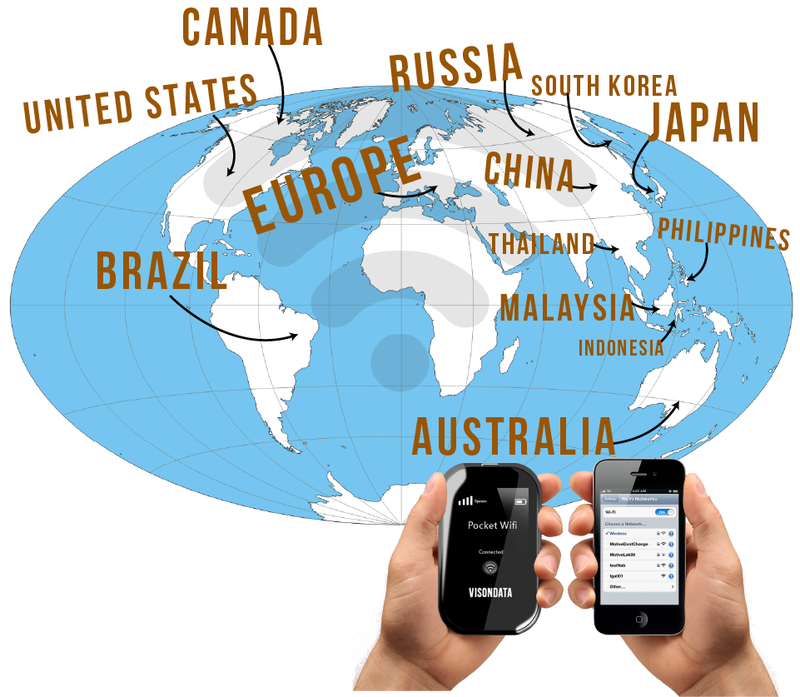 VisondataSG (VDS) is one of the few services that provides low cost pocket Wi-Fi rental services that covers more than 70 countries (as you can see from the diagram below). Before the availability of these mobile Wi-Fi overseas services, I used to scramble to find a local telco shop to buy a local data SIM card upon arrival and not all of them have a shop in the airport. Even if they have a shop there, they operate normal working hours so if I am to arrive in the wee hours, I can forget about registering for a local data SIM card. The registration process for a local data SIM card is also quite a hassle – photocopies of your passport, filling in tens of pages of forms, answering many questions from the telco staff. I fly all the way to the country to have fun and enjoy the sights – not waste hours doing such mundane admin work and it is even worse if I have just taken a long haul flight – severely jet-lagged, tired, sleepy and needing a shower. You might also waste money if you are unable to finish up your stored credits – there are typically no refunds for unused credits (or megabytes) in the local data SIM. 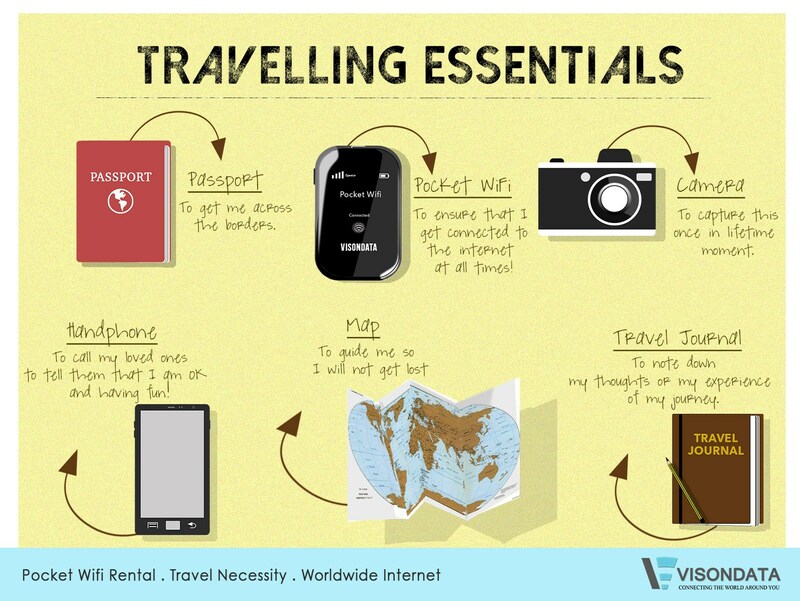 That’s why a pocket Wi-Fi service (in a mobile router device) pre-rented in Singapore is now one of our travel essentials. 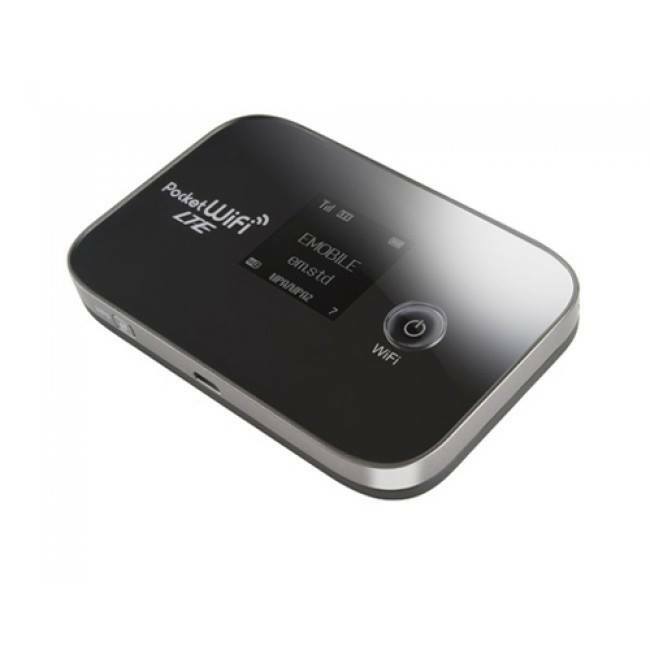 If Wi-Fi is included with your hotel room rate, then you have to decide if you need Wi-Fi on the go during your daily travels (without incurring costly data roaming charges) e.g. if you expect long queues for certain attractions and need some thing to pass the time. Depending on the country where you will be using the mobile Wi-Fi services, the daily rental rates for Visondata pocket Wi-Fi services start from S$9 for Malaysia, Thailand, Hong Kong, Taiwan to S$12 for USA to S$25 for Europe. These rental rates are very affordable especially if you compare them to what you would pay in some hotels (as much as S$50 for a few hours of Wi-Fi) and you can enjoy the Wi-Fi service even when you are out exploring the city. The best part about Visondata pocket Wi-Fi services is that up to five devices (e.g. iPad, laptop, smartphones) can connect to their pocket Wi-Fi device at the same time so if you are travelling with 5 friends/relatives, then the cost per person drops to just S$2+ per day if you are doing a road trip in the USA. The Visondata pocket Wi-Fi device is easy to use – just turn it on and connect your own device to it and you are done. No complex pre-configurations required – you do need to do a one-time input of the Wi-Fi device password and save the network. You are also provided with a travel-friendly pouch with instruction guides, the pocket Wi-Fi device itself and travel adapter charger – very easy to keep – in fact I recommend you keep the pouch (with the guides, charger etc.) in your luggage and just bring the pocket Wi-Fi device out for your trips. You can charge the device using your own portable charging device while on the go. But if you need power banks for your trip (think about all the iPad, handphone and Visondata pocket Wi-Fi device you are bringing out), Visondata also offers rental services of power banks for S$2/day. The Visondata rental power bank has a capacity of 8400 mAh with two outputs (1.5A/1A) and one input. There is also a clear indication of the percentage of battery left once you switch the power bank on. For average devices (with battery capacity of 2000 mAh), the power bank can charge the device up to 4-5 times. With the Visondata EU region plan, you pay just S$25 per day for each day of your trip with one rental. Second, you only pay for the actual duration of travel. So referring to the chart below, if you are travelling from 4th to 10th then you pay for 7 days only. The day you pick-up and return the device (i.e. 3rd and 11th) is not charged. Ordering the Visondata Pocket Wi-Fi service is simple – just sign up at www.visondata.com.sg and decide on whether you want to collect and return the device at the Visondata office at IMM building in Jurong East or have a courier pick-up and return service. Courier pick-up and return will cost an additional S$7 while there are no additional charges for self-collection and return. IMM building is an 8-10 minute comfortable walk from the Jurong East MRT station. There are also shuttle buses from Westgate to IMM building. 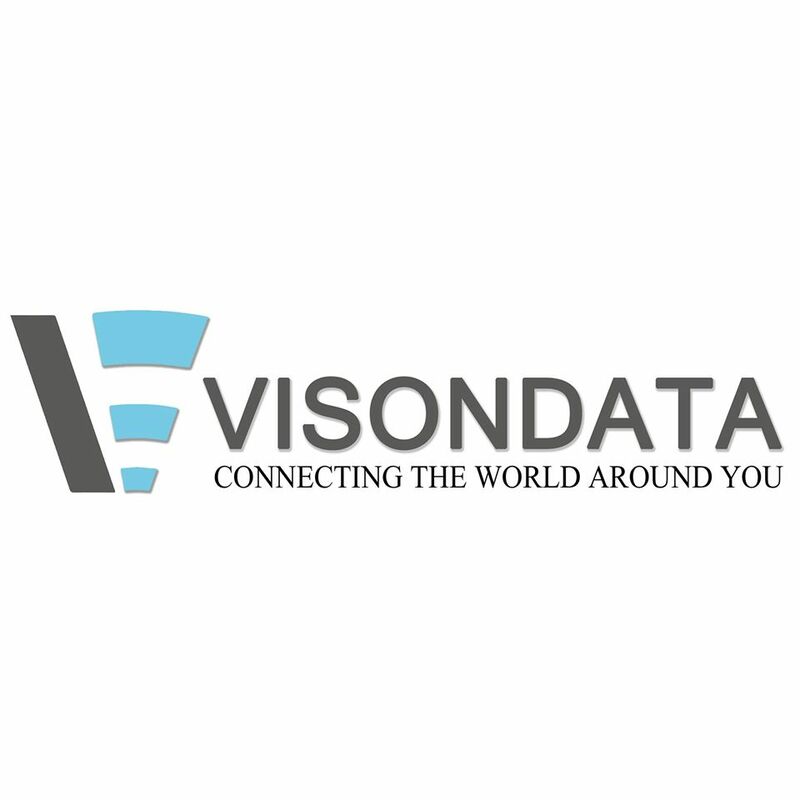 The address of Visondata office is as follows – call ahead to check opening hours. Claim the offer at the Facebook link above and receive a promo code. 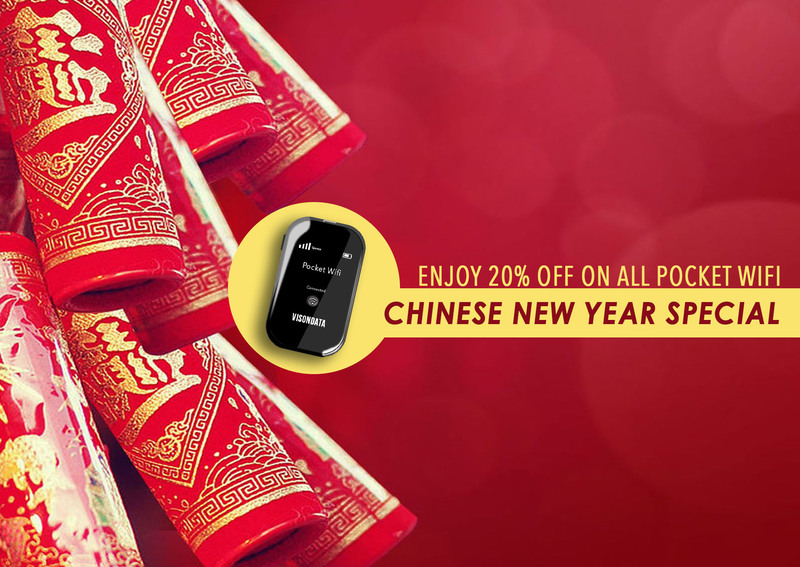 You can use the promo code to enter in Visondata website and get 20% off on all pocket wifi rental. I just tried the promo code and it works even for rental periods beyond 28 Feb 2015. So even if you are planning to travel in April 2015 to see the sakuras in Japan or just planning a holiday anytime over the many long weekends in 2015, you can use the promo code to reserve your pocket Wi-Fi device for your period of travel later in the year.